Reloading is a great hobby for shooters seeking fewer expenses on ammunition. Likewise, you must be concerned with accuracy and precision too. A carefully reloaded ammo pays an enormous reward of fine-tuned shooting. If you are really specific for these considerations, scales designed for reloading must be your buddy. 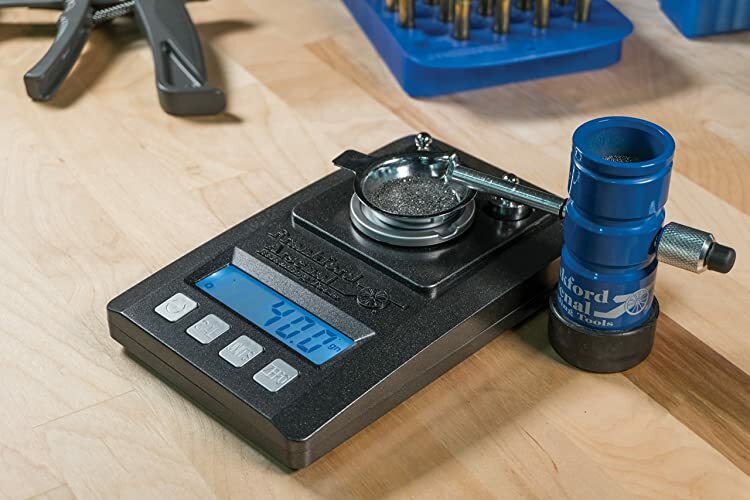 This article features the best reloading scale which will necessarily accompany your reloading tools. Various reloading scales are available on the market with different types, prices, qualities, and portability. 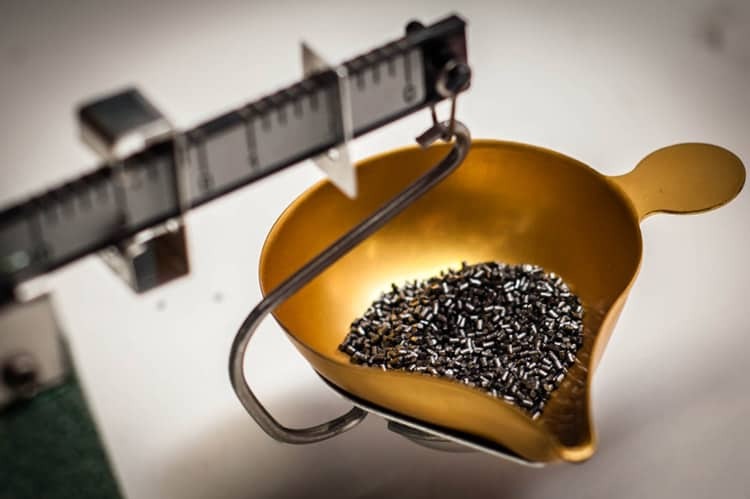 To help relieve your dilemma in choosing the perfect one, here is a list of the top reloading scales. This scale adapts your preference in unit measurements as it can measure grains, ounces, grams and karats. The LCD with high-contrast blue backlight makes your reading easier. It is equipped with two calibration weights that are useful if you will use three-point calibration. This product saves your worry from battery life as it has an auto shutoff function when idle for 3 minutes. This scale from Frankford Arsenal promises to deliver precise measurements and extreme accuracy. It is specially designed for your reloading needs such as weighing powder, loading rounds, cases, and bullets. It features 1500 grain capacity and 1/10 grain accuracy which will perfectly satisfy your precision needs. Its simple controls allow you to weigh and tare weights as quickly as possible. It does not operate to its promised 1/10 grain accuracy. I’m using a chemical spatula when trying to remove some grains. Usability on any situation sets an advantage for this scale as it can operate both in AC or DC. 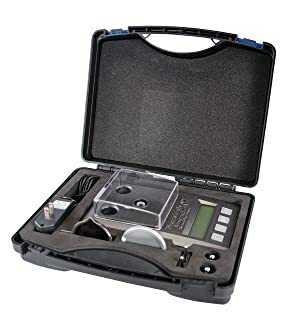 Even if you reload in a field with no power outlets, you can still depend on this scale as it comes with 4 AAA batteries. With its impact-resistant carrying case, you can have a worry-free reloading outdoors. If you prefer mechanical reloading over digital, the RCBS Model 505 is the best for you. This is the only model in this review which is against digital reloading. This scale has been available for more than 20 years. So trust will never be your issue for this product. This scale is made up with an alloy frame and an aluminum pan which gives you assurance against sticking and spilling of powder. It is equipped with three poise beam having a graduated measurement by 10, 1 and 0.1. The graduations are clearly marked with black on white contrast to improve readability for everyone’s eyes, including yours! Its 0.1 grain increments assure the 0.1 grain accuracy you need. My previous mechanical reloading scales had a heavier base. I need to manually add weight to the base just to improve its stability. RCBS remains to be the top manufacturer of reloading equipment. Once you use their product, they assure you with top notch standards, especially for mechanical scales. Note that it only has a capacity of 511 grains. That is somehow the downside when you do not prefer digital scales. If product weight is your concern, this electronic scale might suit your need as it weighs only 2.2 pounds. It is comfortable to use as long as AC power is supplied. With its large LCD, reading will not be your problem. This scale features 0.1 grain accuracy which will suit your accuracy needs. It also includes two calibration weights. Its 1500 grain capacity makes it a good choice for holding a lot of powder especially when you are reloading a lot of ammo. The display has a limited viewing angle. Also, the weight is not precise all the time. I usually check the precision every 10th shell. Precision reloaders must be careful. Automated powder charging systems saves your time and money through speed and efficiency. Technological advancements provide good alternatives, and you will find the Hornady Lock N Load Auto Charge as an ultimate dispensing tool. You will find this reloading scale as very easy to use due to its large keyboard and easy-to-read backlit LCD. Although it is designed for automatic charging, you may still opt for manual dispensing. This is great if you have a reloading friend borrowing your scale who’s used to manual reloads. If you need to add propellant, you may use the trickle function which will do it slowly. Sometimes it results to an overcharge. It is not always consistent though it is close to the real reading as I verify it to my trusted scale. This happens once in a while. It seems like the best remedy is to give a quick restart so that it would work back to optimum. This auto charge scale only takes 5 minutes to start dispensing powder from warm up – that’s two to five times faster than manual scales. But you have to make sure that the scale is isolated from other electrical devices during warm up. It’s great that you can actually control the dispensing speed. You may choose from “slow,” “normal” or “fast” depending on the size of your propellant granules and the charge weights that you desire. 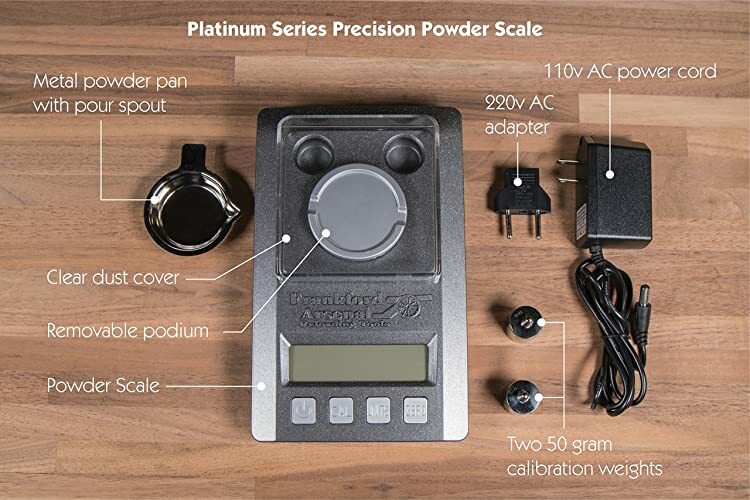 Your reloading won’t be a hassle with its featured 0.1 grain accuracy – a common standard for reloading scales. This scale combines the power of ChargeMaster 1500 Scale and ChargeMaster Dispenser. The unmatched combo brings out the great speed and accuracy you need to deliver an automatic reload. 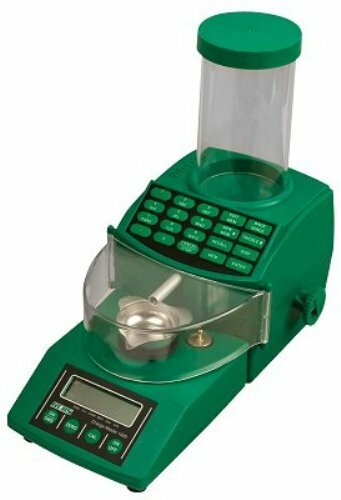 ChargeMaster 1500 Scale features an accurate 0.1 grain scale with a 1500 grain capacity. But for the combo scale featured in this section, it holds a gigantic hopper capacity of 1 lb (7000 grains). The ChargeMaster 1500 Scale uses manual reloading in nature. It needs a ChargeMaster Dispenser for automatic dispensing. This gives a great advantage if you use the combo scale. You could save a huge amount of money if you opt to buy this reloading scale combo. This scale could not be completely trusted. I have to weigh three times just to make sure it gives the precise reading. If you have a memory problem, this scale will help you as it can store up to 30 loads. This scale also gives you an easy access whether you are right-handed or left-handed due to its front-to-back layout. You will also find convenience when emptying the hopper as this scale is equipped with powder drain. The accuracy of this scale still conforms to the standard 0.1 grain capacity. Note that the hopper must only be filled with smokeless powder. It will not work with black powder. 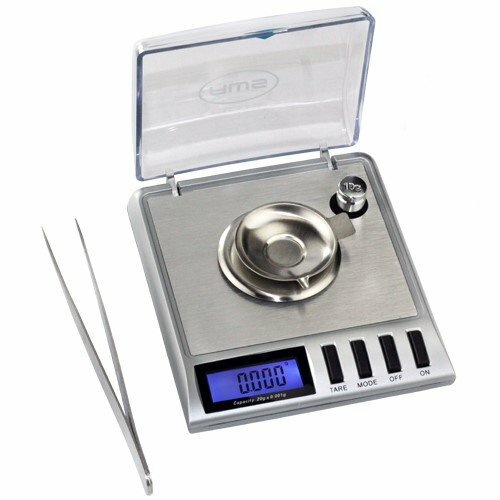 If reloading is just one of the reasons for you to buy a scale, this portable milligram scale might help you. 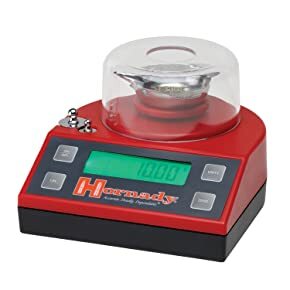 This scale is designed to weigh a variety of items such as gems, chemicals, and powders. With a capacity of 20 g (308 grains), this will solve your manual reloading needs. Two AAA batteries are included with your purchase. This is a useful scale if you are reloading outdoors. But you must prepare for spare batteries just in case you’ll run out of power. It also includes carrying case with tweezers, tray, and calibration weight. It merely provides your basic calibration and reloading needs. I always calibrate this scale with a hope of giving an accurate reading. But I always end up with a 0.1 to 0.2 grain accuracy. I also observe that the precision depends on where I place the case. American Weigh furnished this scale with removable stainless steel. So removing sample will be an easy job for you. The product also comes with a flip-down shield which protects the weighing surface when idle. Reloading scales works like any other scales available on the market. However, scales designed for reloading ensures optimum performance for your needs. 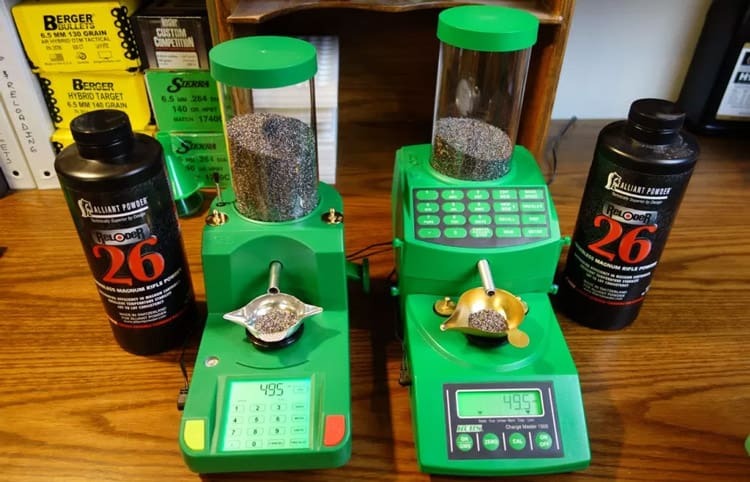 As a buyer, you need to choose your preferred reloading scale through the following list of factors. Mechanical scales consists of a graduated scale with sliding mass. More beams provide more accuracy as it can give varied graduations. For reloading, 0.01 grain graduation is necessary. This type of scale is the first mass-measuring instrument. Thus, outside disturbances such as gravity will not affect your reading. Digital scales requires the user to place it on a static free area. Also, calibration is improved through the use of the “tare” function. Once the powder is placed on the weighing dishes, the weight is then digitally displayed. Some users find the mechanical scales more accurate than digital scales. But it all depends on your preference. It’s a choice between super accuracy and time efficiency. Product quality is still a significant consideration. Some mechanical scales may wear out after extended usage, resulting to reading inaccuracy. Also, some digital scales are not correctly programmed which affects accuracy from the beginning of usage. 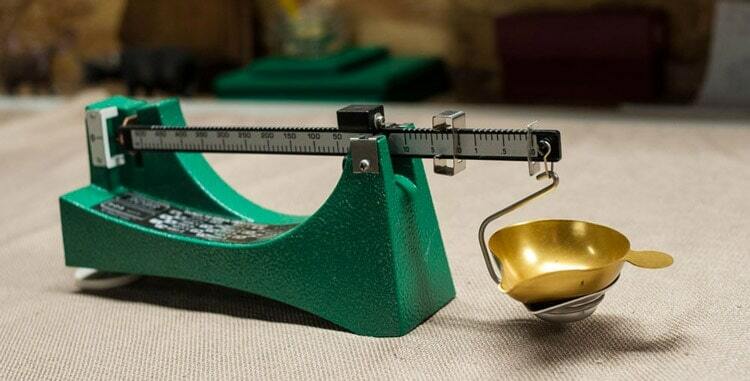 Typically, reloading scales serves its purpose well when it has a 0.1-grain precision. Note that all models still needs calibration before use. Occasional recalibration is also required to ensure optimum accuracy. AC powered scales requires the product to be plugged in the time you use it. Portability seems to be a problem for AC powered scales since the user cannot use it outdoors. Also, a power outage will ruin the situation unless you have generator sets or emergency power supply. Reloading may become necessary when you are out of ammo in the middle of any shooting activity. DC powered scales becomes the great solution as it promotes portability. The user can use it anywhere – even outdoors. The only problem for DC power is when the battery is out of juice. So the user must always have spare batteries. Some scales improves the problem of portability and power efficiency through the combination of AC and DC in one scale. 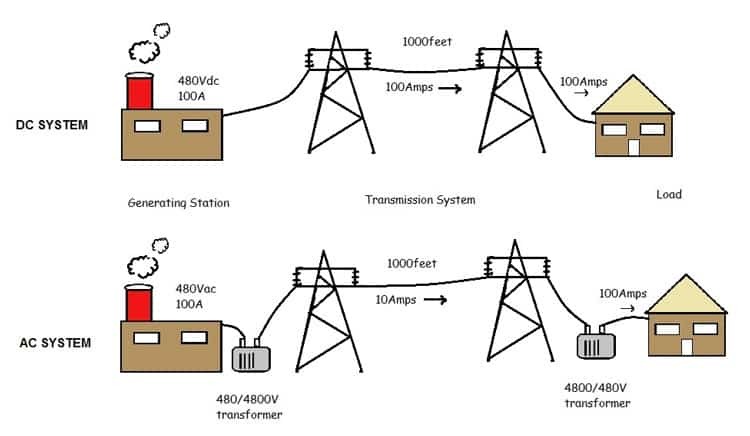 When indoors, connectors are available to provide AC power. When unplugged, the scale automatically jumps to DC power. This combination is a great option among the three as you will take advantage of both power options. Manual dispensing is the traditional way for reloading. 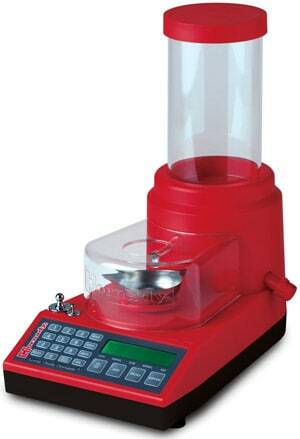 Once you accurately weigh the powder needed, the charges will be dispensed through the use of a crank. Scales with automatic charging relieves your manual operation. All-in-one scales which takes care of both weighing and dispensing improves the speed of reloading. Everything is dependent on the machine. Just load the powder in the hopper, place the empty scales, prepare the shells, and simply click the buttons such as dispensing speed, activate trickling function and specify the charge needed. If reloading is new to you, you really need to take careful considerations. Through our buying guidelines and detailed reviews, you can now assess the best reloading scale you prefer. Note that reloading needs accuracy and precision. Once you master it, reloading becomes your exciting hobby. You will not only save money for this hobby, but you will definitely get to know more about shooting and its core. Now I’m really confused ,why would you even put machines that are inaccurate in the top running for scales.